← Which Protein Is Best For Weightlifters And Bodybuilders? Obesity is the number one health threat facing the planet, according to the International Red Cross. And the childhood obesity epidemic is even more troubling, since it may well lead to a massive growth in medical problems as these kids grow into adulthood and even reverse the gains we’ve made in overall longevity. No one can deny this is a major problem not just in the western world, but globally. So what’s the main cause of the meteoric rise in childhood obesity? Lack of exercise is often suggested, and could well be a part of the problem. Yet the lack of exercise is more common amongst those of advanced age – seniors with limited mobility. So if lack of exercise was the main culprit, wouldn’t the highest rate of obesity be among seniors? The main culprit then has to be poor nutritional habits. Our ancestors ate raw meats & fish as their main diet, with raw fruits and vegetables on occasion. Recent generations cooked their meals, but most of their diet was still non-processed foods. And for the most part both ate in moderation. Today’s kids are eating a lot of processed, sugary, high-carb foods – and a LOT of it. Enter the fast-food chains… Some have a reasonably balanced menu, even bordering on healthy. But the bulk of them are serving up highly-processed foods with high levels of simple carbohydrates, fats and especially sodium. Granted, each can be healthy when consumed in moderation as part of a balanced diet, but the recent up-sizing of these meals plays to the opposite effect. And serving larger and larger sodas is just compounding the potential dangers. And what about the way these chains advertise their wares? Ethical marketing dictates that you advertise to adults who can make a rational decision about what they buy, what they eat, and how they balance their overall health. But what about ads obviously directed at children who don’t have the experience, knowledge or emotional stability to make such decisions? And adding toys as an extra incentive? A spate of lawsuits has recently cost the tobacco companies billions of dollars. These cases were based on the practices 50 years ago of promoting cigarette smoking while the companies knew of the health danger presented. Smoking was a very common practice at the time, and the public had the choice of whether to smoke or not – but the courts have ruled that the companies are still liable for not warning the public of the potential pitfalls involved in consumption of their products. Even governments have gotten in on the action, successfully suing to reclaim some of the additional health costs created by people smoking. At the time, smoking was legal and advertised as ‘cool’ – even fun. And what, exactly, is so different about today’s issues with some fast-food chains and childhood obesity, except that the symptoms of the ‘evils’ of today’s products are showing up much more quickly? The two situations bear a striking similarity, don’t they? Remember the iconic ‘Marlboro Man’ and ‘Joe Camel’? Food for thought next time you watch a fast-food commercial full of characters singing the praises of poor nutritional products. And given the growing childhood obesity epidemic, if you have children or grandchildren consider their healthy nutritional needs next time someone asks you if you want fries with that – or better still, make them a healthy meal or take them to a family restaurant that does have a healthy menu. Show your love by helping them stay happy & healthy and give them a brighter future too! This entry was posted in Healthy Nutrition and tagged childhood obesity, fast-food chains, healthy, lawsuits, nutritional, obesity, obesity epidemic. Bookmark the permalink. 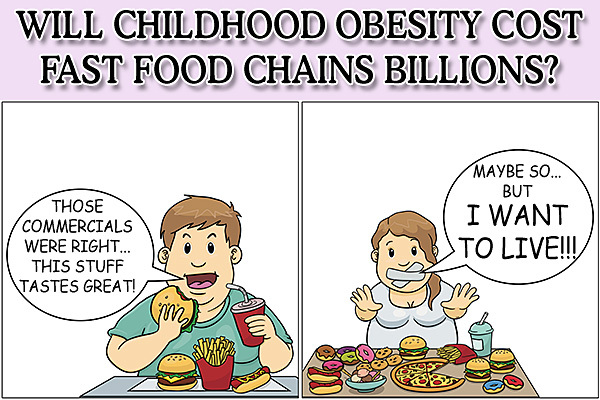 2 Responses to Will Childhood Obesity Cost Fast-Food Chains Billions? Parents that both work 60 hour work weeks, as well as those at the opposite end of the financial spectrum are a big factor in childhood obesity. Our society teaches us to make as much money as we can, and the only way we can squeeze all the work in is with convenience foods. A 100 years ago when we had to plow our own fields by hand we actually worked less. It’s true believe it or not. You’re right, Matt – but those are only ‘excuses’, not ‘reasons’. Those same parents still have time to watch TV, can still afford smokes and beer, etc. Parents need to take responsibility for their children’s health, and society in general has to realize that it does no good to make a lot of money if you’re not healthy enough to enjoy it – or don’t live to enjoy it. TC & I got on the wrong path when our Internet marketing business took off, and in just 6 years of not staying in shape our health took a major turn for the worse. We’ve made great strides in the last 18 months, but still have a ways to go to offset those 6 years. And that’s exactly what led to the creation of this site – the hope that we can spare others the same mistakes we made. Thanks, as always, for being one of our top, most informed and helpfull commentors – Hope all of our readers are also reading your awesome fitness blog at MattToronto.com!